A hero is only as good as his villains, some say. 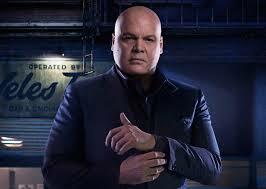 In the Daredevil series, Wilson Fisk (Kingpin in the comics) has been a great contrast to Matt Murdock. Fisk isn’t moustache-twirlingly evil, doing bad things for the sake of being a bad guy. Fisk had a goal and a dream that he believes in, and he honestly thinks what he’s doing is for the greater good. “The Boy Who Would Be King” is largely about Fisk’s childhood. Consider it the origin for the villain. Early in the episode Fisk goes through his morning routine in his luxury apartment. This is contrasted nicely by Matt in his crappy apartment, which was broken up fairly thoroughly last episode when Matt fought Stick, his former mentor. In another series of contrasted scenes, Foggy and Karen argue about bringing Matt in on their work with Urich as they try to get enough evidence to bring down Fisk. Even as things get tense and serious, there is still some amusing banter among the friends. Matt is insistent they work within the legal system. Foggy and Karen think Matt is being naive, but Matt, with what he’s seen as Daredevil, is trying to keep them safe. In much nicer surroundings, Fisk, his right hand man Wesley, and Nobu, have their own meeting. Nobu is not happy about the loss of the Black Sky weapon, as seen last episode. Nobu blames Fisk for not doing enough, but Fisk calmly points out that Nobu asked for the docks to be clear of police, and Fisk did just as asked. All is not well within the ranks of Fisk’s criminal alliance. Much of the episode is about Fisk’s childhood. Fisk’s father was a blue collar man with dreams of running for office. Unfortunately, it’s not the “gain office to make the world better,” kind of dreams. He wants a chance to get the bribes he believes all public officials take, and makes a lot of bad decisions in pursuit of this goal. Let’s just say that Wilson did not have a happy childhood. In the present, Fisk has arguably too many balls in the air. His own organization is not as solid as he’d like it to be, and that’s only the beginning of his problems. Some of his crooked cops are talking, and cleaning up after them is getting harder with Daredevil lurking in the shadows. Fisk’s relationship with Vanessa is also developing, distracting him from some of his business, or at least adding another element that demands his attention. One of the things I really enjoy about this series is that the characters are all developed, sometimes in surprising ways. Madame Gao asks for a meeting with Fisk, and their relationship gets a lot of attention. Gao seems to be Fisk’s only ally he actually cares about offending. She reveals a few surprises, and tells Fisk he is getting sloppy. The meeting ends on something of a threat, and Fisk doesn’t react well, even yelling at his faithful sidekick Wesley. Fisk and Wesley’s relationship also gets some nice play here. Wesley clearly cares about Fisk, and risks getting him even madder to do what he thinks is right for Fisk. Considering Fisk’s brutal temper, often with homicidal results, this shows how both brave and loyal Wesley is. Daredevil finally decides he needs more help, and goes to meet with Urich. It’s a very tense meeting, as Urich isn’t really sure whose side the masked man is on. Considering everything that’s happened, and all the disinformation flying around, that’s a fair enough concern on his part. The two talk, and debate methods of going after Fisk. It’s a nicely done scene, and Daredevil ends up giving Urich a few names he didn’t have yet, like Leland Owlsley. The reporter and the vigilante don’t exactly see eye to eye, but they end up agreeing to work together. Just as things are coming together well, Fisk pulls a surprise. Urich is ready to expose him, and Daredevil is more than ready to leap in from the darkness to go after his muscle. But Fisk is a damned smart opponent, and turns the tables on the heroes in a very unexpected way. By the time he’s done, Matt’s alter ego has a new name- the Devil of Hell’s Kitchen. Fisk made a gutsy move and essentially preempted Urich’s article. All the good guys are shocked and left scrambling for a new way to go after Fisk. What I liked: There is some brilliant writing on this series. The characters are all three dimensional and full of surprises. While I’m not sure we needed quite this much time on Fisk, it showed why he is the man he is, and fleshed him out nicely. It also gave some nice touches to Wesley and Gao, who are two of my favorites at this point. Fisk is smart and ruthless, and the writers are doing great things with him. The contrasting scenes near the beginning were also very nicely done. Fisk’s father was a loser, but a very believable one. What I didn’t: As I said, I’m not sure we needed quite this much time on Fisk. There are lots of other aspects of the story they could be developing. It really is starting to seem like there is no place Fisk can’t reach, and it’s beginning to stretch believability a bit. The series is very nicely put together, and I am enjoying the time they spend developing all the characters. This is a great example of superhero drama done right. It’s certainly on par with many of Marvel’s movies for quality and enjoyment. I can’t wait for the other three Netflix series. If they are anything like this one, they are going to be fantastic. I’ll give this episode a 3.5 out of 5.